The present work aims to study a new NADH-cytochrome b5 reductase (cb5r) from Mucor racemosus PTCC 5305. A cDNA coding for cbsr was isolated from a Mucor racemosus PTCC 5305 cDNA library. The nucleotide sequence of the cDNA including coding and sequences flanking regions was determined. 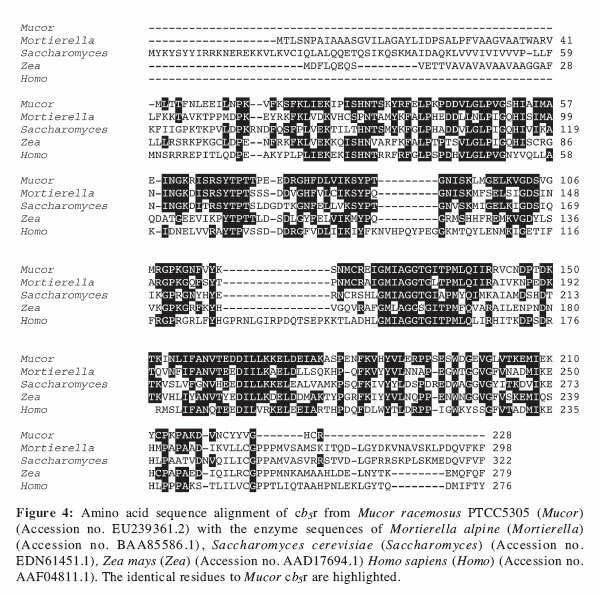 The open reading frame starting from ATG and ending with TAG stop codon encoded 228 amino acids and displayed the closest similarity (73%) with Mortierella alpina cbsr. Lack of hydrophobic residues in the N-terminal sequence was apparent, suggesting that the enzyme is a soluble isoform. The coding sequence was then cloned in the pET16b transcription vector carrying an N-terminal-linked His-Tag® sequence and expressed in Escherichia coli BL21 (DE3). The enzyme was then homogeneously purified by a metal affinity column. The recombinant Mucor enzyme was shown to have its optimal activity at pH and temperature of about 7.5 and 40 °C, respectively. The apparent Km value was calculated to be 13 μM for ferricyanide. To our knowledge, this is the first report on cloning and expression of a native fungal soluble isoform of NADH-cytochrome b5 reductase in E. coli. (Hildebrant and Estabrook, 1971), biotransformation of drugs (Jaffe and Hultquist, 1995) and methemoglobin reduction in erythrocytes (Kiato et al., 1974). In the past, cb5r and cb5 were considered as "helper" enzymes involved in intermediate electron transfer (Porter, 2002); however, recently it has been shown that these two enzymes could be directly involved in the metabolism of various pharmacological agents including hydroxylamines and amidoximes, such as sulfamethoxazole hydroxylamines and benzamidoximes (Kurian et al., 2004). The deficiency of cb5r in human erythrocytes causes recessive congenital methemoglobinemia. Diagnosis of this disease is performed by determination of cb5r activity as a laboratory tool (Lan et al., 1998). The cb5r enzyme happens to play a key role in the mediation of NADH-induced redox activity in human spermatozoa (Baker et al., 2005). Various isoforms of cb5r, including soluble, microsomal and outer membrane forms, are coded by a single gene. Soluble and membrane-bound enzymes are identical in the cytoplasmic catalytic domain but different at the N-terminus. The soluble forms of cb5r are generated by an alternative promoter mechanism combined with initiation of translation from a downstream AUG (Borgese et al., 1993). Previously; however, it had been thought that soluble forms of cb5r were generated by post-translational proteolysis during erythrocyte maturation (Yubisui et al., 1987). The best functionally characterized cb5r, known as methemoglobin reducíase, exists in the soluble form in erythrocytes and keeps hemoglobin iron in the reduced state needed for 02 binding (Bagnaresi et al., 1999). The related sequences (Yubisui and Takeshita,1982; Yubisui et al.,1986), genomic structures (Tomatsu et al.,1989), kinetic features, physicochemical and structural properties of the human enzyme have been well characterized (Ozlos and Strimatter,1984; Strimatter et al.,1990; Yubisui et al., 1991; Bando et al., 2004). The sequence of cb5r isoforms or closely related homologues, such as NFR (NADH-dependent Fe+3-chelate reducíase), have been determined among the genomes of a wide spectrum of organisms from higher eukaryotes such as human (Yubisui et al., 1996) and other mammals (Roma et al 2006) to other eukaryotic members, including plants (Fukuchi-Mizutani et al., 1996; Bagnaresi et al., 1999), nematodes (Kamath et al., 2003), fungi (Sakuradani et al., 1999), yeast (Csukai et al., 1994) and insects (Adams et al., 2000). Despite the many protein sequences of this enzyme presented in the databases, the native enzyme has been isolated from a limited number of eukaryotic sources (Takesue and Omura, 1970; Yubisui and Takeshita, 1980; Schafer and Hultquist, 1980). However, through developing recombinant expression systems, it has been possible to obtain various cb5r isoforms (Sakuradani et al., 1999; Roma et al.,2006). Mucor racemosus is a dimorphic fungus, which is capable of growing either as spherical multipolar budding yeast cells or as filamentous mycelia under different environmental factors in the vegetative state. Growth in the yeast form is generally due to anaerobic conditions and the presence of a fermentable hexose (Orlowski, 1991). Mucor racemosus PTCC 5305 was isolated in a soil screening project, aimed at studying intra- and extracellular enzymes in our laboratory. Herein, we have isolated and identified the cDNA of cb5r during a systematic analysis of the Mucor racemosus PTCC 5305 cDNA library. The cDNA has been cloned and expressed in E. coli. Recombinant enzyme purification and characterization has also been described. The microorganism was cultured in a basic medium consisting of maltose (0.6% w/v), uric acid (0.7% w/v), Vogel trace element solution (2% v/v) and CuS04 (0.5 ^iM). The pH of the medium was adjusted to 6±0.05. The culture was incubated at 30 °C with a shaking rate of 150 R.P.M for 24 hours. 100 mg of cultured mycelium was collected by filtration, which was ground in liquid nitrogen using a mortar and pestle. The cells were lysed under highly denaturing conditions, in a solution containing guanidine isothiocyanate (5.4 M, pH 6.5). The cell lysate was centrifuged at 10000 g and the supernatant subjected for total RNA extraction by RNeasy Plant Minikit (Qiagen) as instructed by the manufacturer. The quality and quantity of extracted RNA was monitored by spectrophotometric methods and denaturing by agarose gel (1%) electrophoresis. Double stranded cDNA was constructed by using cDNA synthesis system (Roche) using 15 jig total RNA as the starting material. The blunted ds-cDNA was cloned using Blunt-end PCR cloning kit® (Roche) according to the kit instruction manual. 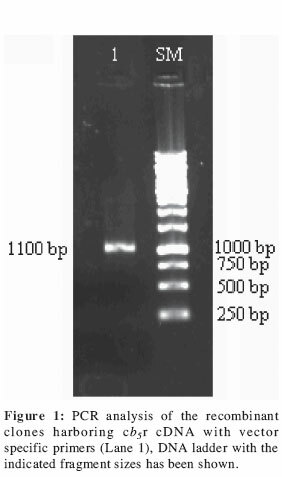 The resulting colonies were subjected to PCR, using primers for direct PCR included in the kit, based on the nucleotide sequence of the supplied vector. The selected clones contained the inserted fragment of interest and had a size ranging from 1000-1200 bp. These clones were then sent for sequencing using vector specific primers. The resulting sequences were analyzed by Blast software (NCBI) for homologies. The one which showed the most homology to NADH-cytochrome b5 reducíase was selected for further analysis. Multiple sequence alignment was constructed using ClustalW program. The insert was amplified using two specific primers with suitable cut sites (Ndel and Xhol) for ligation and expression in pET16b. Forward primer was "5'GAATTC CATATGCTGACCACTTTCAAC3'" and reverse primer was "5'TGTGCGGAGATC AGGTTCTGATCCTC3'". PCR was carried out using Unipol®, long range PCR enzyme mix (Ampliqon) and the PCR product was cut and then ligated into the identically cleaved plasmid. E. coli DH5oc was transformed by the ligated DNA. Positive colony selection was performed by PCR. Then the plasmid was extracted and used for transformation of E. coli BL21 (DE3). The recombinant and non-recombinant pET16b transformed E. coli BL21 (DE3) were cultured in LB medium containing Ampicillin (100 [xg/ml), up to OD 0.4 at 600 nm. Then 0.1 [xM IPTG was added to induce expression of the cloned gene and culturing was continued up to OD 0.6. The cultures were centrifuged and cells were lysed, using a lysis buffer containing lysosyme, followed by sonication and subjected to purification. Recombinant protein was purified using Ni-NTA kit® (Qiagen). The expression and purification of recombinant protein was monitored by sodium dodecyl sulfate-polyacrylamide gel electrophoresis (SDS-PAGE). The non-recombinant pET16b transformants were used as the blank sample in the above mentioned processes. Cb5r activity was determined by measuring its NADH-ferricyanide reduction. (Sakuradani et al., 1999). The assay mixture contained 0.1 M potassium phosphate buffer with pH of 7.5, 0.1 mM potassium ferricyanide, and 0.1 mM NADH (or NADPH) in a final volume of 1 ml. The reaction was started at 25 °C by addition of 10 [i\ of enzyme solution and the reduction of ferricyanide was followed at 420 nm using a recording spectrophotometer (Shimadzu). The activity was calculated from the initial rate of decrease in absorbance by using an extinction coefficient of 1.02 /mM x cm (Sakuradani et al., 1999). One unit of enzyme activity was defined as the amount of enzyme causing the reduction of 1 [imol of ferricyanide per minute under the defined assay conditions. The molecular mass of the enzyme was determined by SDS-PAGE on a 15% polyacrylamide gel. The initial velocities of ferricyanide reduction at pH 7.5 and 25 °C were determined at variable concentrations of ferricyanide. Km and Vm were calculated from a double reciprocal plot. To examine the effect of pH on the activity, a variety of buffers providing different pH ranges were used. The effect of temperature on enzyme activity was measured after 5 min incubation of the assay reaction at a given temperature and adding the enzyme under the described assay conditions. All the experiments were done in triplicates. During sequence analysis of PCR amplified fragments with sizes ranging from 1000-1200 bp, which was done using vector specific primers in a M. racemosus cDNA library, a cDNA for cb5r was identified (Fig 1). The nucleotide sequence consisted of 1102 bp and contained an open reading frame with 687 bp, which started at ATG and ended at TGA to encode for a protein with 228 amino acid residues. The protein had a calculated molecular mass of 25.66 kDa and a pi of 8.18. The sequence has been submitted to GenBank database under accession number EU239361.2. As presented in Figure 2, the cb5r coding sequence is flanked by a 5'- and 3'-untranslated region. The 3'-UTR ends in a poly-A tail. 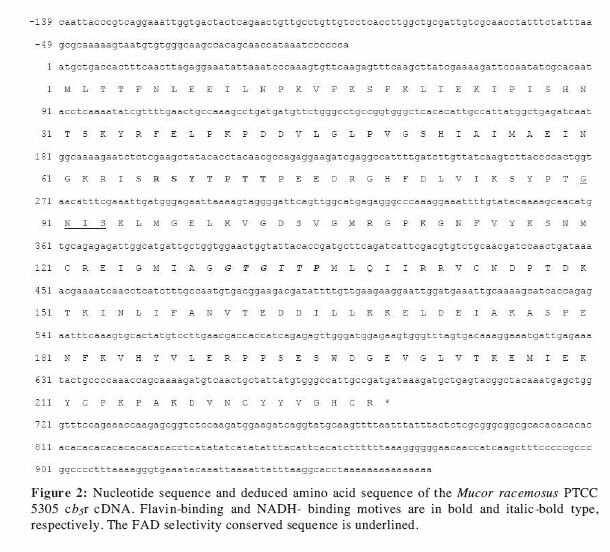 The amino acid sequence deduced from the nucleotide sequence contains FAD-binding and NADH-binding motives which are common in the enzymes of the ferredoxin NADP+ reducíase family. Based on the hydrophobic index calculation by Kyte-Doolittle method, no significant hydrophobic domains were found (Fig 3). The deduced amino acid sequence of the cloned M. racemosus cb5r cDNA showed closest homology with Mortierella alpina cb5r (57% identity, 73% similarity). M. racemosus cb5r sequence demonstrates significantly high homologies with other fungi, as well as with those of mammalian sources (43% identity, 64% similarity with human cb5r), as presented in Figure 4. Recombinant cb5r was expressed to characterize the Mucor enzyme. The whole ORF was used to construct the expression plasmid and it was considered to encode for a soluble enzyme. The enzyme assay of crude extract showed about a 15-fold increase in ferricyanide reduction activity, in comparison with blank (164 //mol/min/ ml vs. 11 //mol/min/ml). The crude extract of transformed E. coli BL21 (DE3) cells was purified to homogeneity. 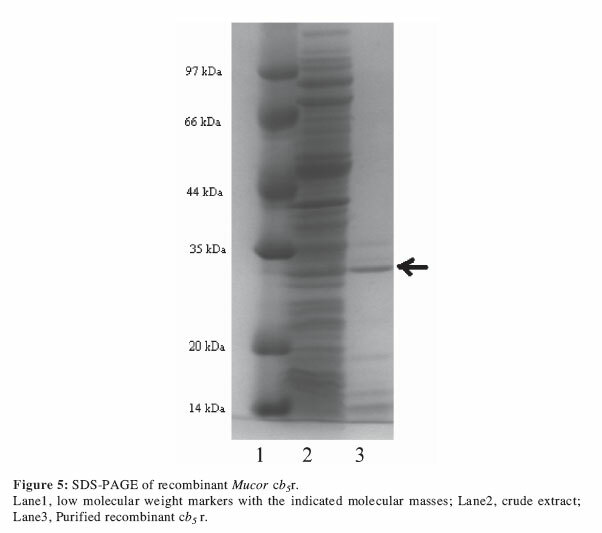 Evaluation of the one step purification has been presented in Table I. SDS-PAGE analysis of the purified recombinant enzyme showed a band of about 30 kD (Fig 5). 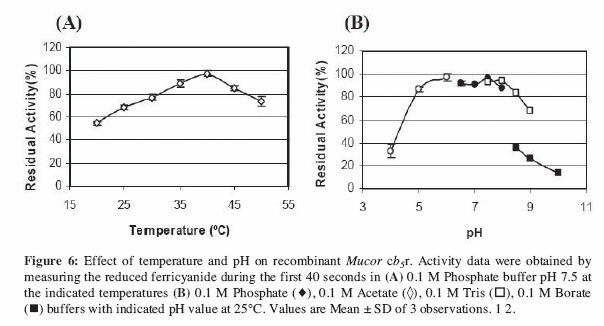 The effects of temperature and pH on the enzyme activity of Mucor cb5r, have been shown in Figure 6. The apparent Km and V m value of recombinant enzyme for ferricyanide is about 13 mM and 103 //mol/ min/mg, respectively. Comparison of ferricyanide reduction by NADPH versus NADH, as electron donors, with the recombinant enzyme revealed a 92% decrease in specific activity. Mucor racemosus cb5r cDNA contains a 228 residue open reading frame. The general length of other cb5r isoforms is between 270-320 aa residues. The sequence of translation start codon had low homology to the reported Kozak consensus. A poly-A tail at the 3' end shows the completion of the protein sequence at the C-terminal. An "AATTAAA" sequence, located about 20 nucleotides upstream of the poly-A tail, was determined as the poly adenylation signal which is homologous to the consensus poly adenylation sequence in eukaryotes. After analyzing the deduced amino acid sequence by BLAST, two distinct regions, a FAD-binding-6 domain (residues 18 to 116) and a NAD-binding-1 domain (residues 126 to 228), were found, which show high similarity to the other cb5r isoforms. The NAD-binding motif (GxGxxP) of the - ferredoxin NADP+ reducíase family was found in the deduced amino acid sequence of Mucor cb5r; however, in the flavin binding motif (RxYTxxS) the serine residue is substituted by a threonine. Such an alteration has been detected in other enzyme sequences especially in plants and some other fungi (Bagnaresi et al., 1999). Because of the close structural similarity and polarity of serine and threonine, this substitution may not affect FAD binding activity. Moreover, conserved sequence motif, which is associated with FAD selectivity (GxxS), has been identified. A short region of 11 amino acid residues, as shown in the hydropathy plot, lies within the FAD-binding region, and thus cannot be considered as a binding domain. Among other cb5r isoforms, there is usually a membrane binding domain upstream of the FAD-binding region which is not characterized in the Mucor enzyme. As there was no hydrophobic sequence detected at the N-terminal of the deduced protein, the whole ORF was used to construct the expression plasmid and it was considered to encode for a soluble enzyme. The previous recombinant enzymes coded by other organisms were cloned and expressed as truncated enzymes, in order to produce the soluble isoform, to facilitate the next steps for further analysis (Bagnaresi et al., 1999; Roma et al 2006 and Ikegami et al., 2007). In the amino acid sequence of human and other vertebrates' cb5r two peptide sequences, 9 and 16 residues were identified between the FAD- and NADH-binding regions that do not exist in the lower-eukaryotes. The peptide of 9 residues maintains NADH-specificity by covering crevices between the two domains of the enzyme in humans. Despite the absence of this covering peptide, specificity of Mucor enzyme, in comparison with the Physarum cb5r, is considerable (Ikegami et al., 2007). 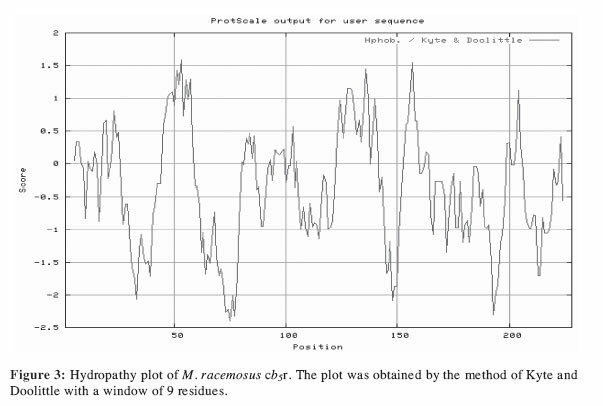 In our study, the active enzyme was found in the lysate of recombinant E. coli. However, the amount of expressed gene product was not high enough in comparison to what is typically reported using pETlob expression vector. As presented in Figure 5, the crude extract lacked any significant band for the recombinant protein The comparison of codon usage pattern of M. racemosus PTCC 5305 and E. coli, showed significant differences which could be the reason for the low amount of expression in E. coli. The effect of codon usage on expression of this enzyme in E. coli was also reported by Sakuradani et al. (1999). They reported the cloning and expression of c&5r from Mortierella alpina in Aspergillus oryzae, however, they could not get expression in E. coli, and they concluded that it could be due to differences in codon usage. Mucor cb5x showed a basic nature as the Physarum enzyme based on its isoelectric point calculated from the deduced amino acid sequence, in contrast to the neutral pi of the human enzyme (Ikegami et al., 2007). Recombinant cb5r characterization showed that temperature does not cause any considerable decrease in enzyme activity between 20 and 45 °C, although the best temperature for the enzyme activity is 40 °C. There was no reported temperature optimum or temperature range for this enzyme in the literatures that we have reviewed. The optimum pH for enzyme activity was determined to be about 7.5 although no significant difference in the pH range of 6-8 is obtained. This is in accordance with other findings, which determine a pH value within the neutral range (Ikegami et al., 2007). The apparent Vm of recombinant enzyme is comparable to what has been reported in other organisms (Yubisui et al.,1991; Sakuradani et al., 1999; Ikegami etal., 2007). In conclusion, here we successfully isolated and identified the cDNA encoding cb¡r of the Mucor racemosus PTCC 5305. For the latter, the encoding sequence was first cloned and expressed heterologously in E. coli as a functional enzyme. Throughout this study we characterized the recombinant Mucor enzyme and reported on a native soluble isoform of cb5r in fungi for the first time. This study was supported by the grant numbers of 5077 and 6036 from the Research Council of the Tehran University of Medical Sciences.